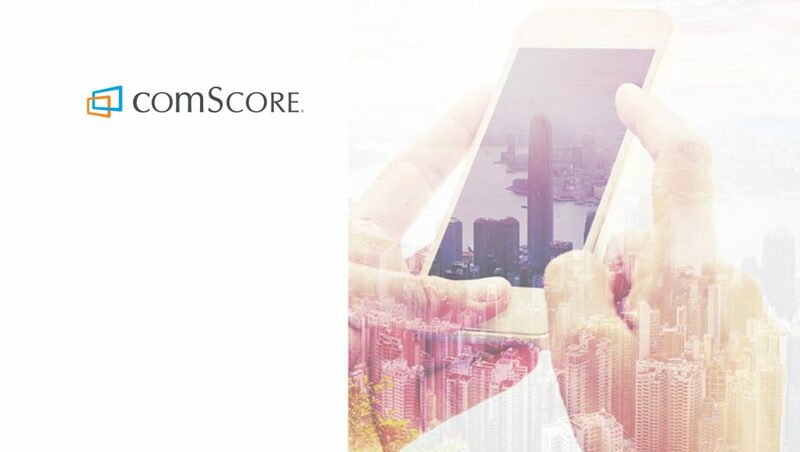 comScore reported U.S. desktop retail e-commerce spending for Thanksgiving Day and Black Friday 2017. Thanksgiving Day (November 23) saw a 22-percent gain to $1.57 billion in spending to surpass the billion-dollar threshold for the fourth consecutive year. Black Friday (November 24) followed with an even stronger spending day with $2.36 billion in desktop online sales, up 20 percent from Black Friday 2016 and marking the first time it reached the $2 billion milestone from desktop sales alone. “Thanksgiving and Black Friday each saw impressive online spending totals on desktop computers while posting 20-percent growth rates, adding to the holiday season’s fast start compared to 2016. With more consumers opting to kick off their holiday shopping online on Thanksgiving, the traditional day of giving thanks has also become one of the more important online buying days of the holiday season as an increasing number of people prefer to get a head start on their buying from the comfort of their homes. 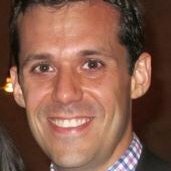 Black Friday continued the online shopping frenzy, surging to an all-time high of more than $2 billion in desktop spending, and proving once again that it is now as much an online shopping holiday as a brick-and-mortar one,” said Andrew Lipsman, SVP of Marketing and Insights, comScore. 115 million people visited online retail sites on Thanksgiving, 61% of whom only visited on their mobile devices. 129 million people visited online retail sites on Black Friday, up 14% vs. last year, with 55 million coming via desktop and 104 million via mobile (and 30 million on both). 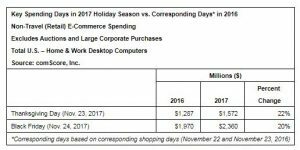 Growth in Thanksgiving Day desktop retail e-commerce sales was predominantly driven by an increase in buyers (+16% vs. a year ago), but also modest increases in the number of dollars per transaction (+3%) and transactions per buyer (+2%). Apparel & Accessories ranked as the top product category on Black Friday with more than $600 million in desktop sales, followed closely by Consumer Electronics with more than $500 million.